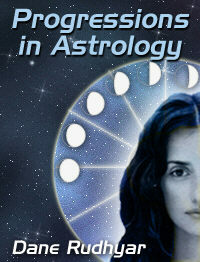 In this two-part article Rudhyar clearly explains the theory and practice of progressions in astrology. Start with Part One, The Meaning and Use of Progressions in Astrology, then read Part Two, Converse Progressions and the New Moon Before Birth. One of the many astrological topics which needs clarification and a more revealing and significant approach is what is usually called "progressions" — or secondary progressions. According to textbooks being studied today, it is possible, by considering the positions of the planets each day after birth, to foretell at least some of the basic events that can be expected each corresponding year after birth. The basic principle is that there is some sort of correspondence between the daily cycle of the earth's rotation around its axis and the yearly cycle of our planet's revolution around the Sun. The moment of the "first breath" of the human organism establishes, as it were, the person's permanent individual character underneath all subsequent changes; this is the birth-chart. But changes are incessant after birth. The earth rotates; the Sun, Moon, and planets move on in their orbits and the astrologer claims that what happens in the solar system during the 24 hours after birth somehow gives us basic clues to changes occurring in the human being during the whole first year of his life, each hour corresponding to a fortnight of actual existence. Thus, if a person is born on January 1, 1965, at noon Greenwich Time, the positions of the planets at noon January 2 — called the "progressed planets" — will refer to the person's development and the basic events of his life on January 1, 1966, and so on. If one wants to know what the person will face around his 20th birthday (1985), one will write down the progressed positions of the Sun, the Moon, and the planets for January 21. On that day, some of the aspects between the planets are different from those on January 1; the new aspects will be re-referred to as "progressed-to-progressed" aspects. But the new positions of January 21 can also be related to the positions in the January 1 birth-chart — for instance, the "progressed Moon" during the morning of January 21 is at 23° 57' Virgo, making a conjunction with the position Mars had at birth on January 1, 1965. Such a conjunction will be called a "progressed-to-radical" (or natal) aspect. My purpose in this article is not to state in greater detail the technique for the calculation of such progressions, but rather to try to understand why they should have any validity at all and to what area of predictability they more logically refer. Obviously, the positions of the Sun, the Moon, and the planets for January 21, 1965, do not refer to celestial facts noticeable at the time of the 21st birthday (January 1, 1985) of the person born on January 1, 1965. The factual positions of the planets on that January 1, 1985, when referred to the positions of the planets in the January 1, 1965, birthday constitute what are called "transits." Transiting positions are existential facts; progressed positions are not. If they are to be considered as facts, it can be so only if they are integrated into a picture of the entire life process which began even earlier than birth — that is, at the moment of impregnation of the female ovum by the male spermatozoon. To say that progressions have validity because somehow the day cycle "corresponds" to the year cycle can only mean that they constitute a purely symbolic factor. The "doctrine of correspondences," as it is called, has been made responsible for almost anything along so-called occult lines. On that basis of an assumed correspondence between celestial cycles, a system of "tertiary progressions" has been taught in which a cycle of the Moon after birth is made to correspond to a year of the life after birth; and any cycle could be made to correspond to any other. We could just as well say that if you want to know how your child will be at the age of 30 days, you should look at the planets' positions 30 years after his birth. Who knows, this might "work" — but it involve practical difficulties until our electronic computers have been made to figure planetary positions for 10,000 years ahead as well as back. It is indeed rather fascinating to think that a baby might have died at the time of his first birthday in 1599 A.D. because there is this year a conjunction of Mars, Uranus, and Pluto in opposition to Saturn affecting what was his natal Sun. Why, theoretically, stop at the equivalence of year and day? One could use the same concept and relate a precessional cycle of around 26,000 years to a solar year or a day; a degree of precession (about 72 years) could be related to a whole precessional cycle, etc. All such correspondences can be theoretically valid, just as it may be true to say that there is a structural correspondence between a man, as microcosm, and the universe, or macrocosm. Such concepts belong to the field of pure symbolism; and astrology as it is practiced today is in a sense a symbolic type of knowledge. Symbols are very powerful, and we deal with them constantly. Words are symbols, as are all slogans and catch phrases, all rituals. A national flag and anthem are symbols. The English Queen is a symbol; so is the White House. The whole sky has been for man, struggling out of the chaos of the jungle (and there is a psychological jungle very much in evidence today), the great symbol of "order" — which means periodicity and predictability. We must, of course, use symbols, but we should try to use them while realizing vividly the kind of life processes to which they refer. We should try to understand and to feel the concrete processes of which the abstract symbols reveal the essential structure. Thus, if I say that a day after birth "corresponds" to a year of actual living for an individual human being, it should not be enough to take intellectual refuge in the concept of the symbolic equivalence of the earth's daily rotation and the earth's yearly revolution. What we must try to realize is what it is that actually happens in a human being during the days after his birth — i.e., what process is at work within him. It must be a basic and far-reaching process if it is true that what occurs in that process ten days after birth actually has a direct repercussion upon the bio-psychic state of that person at the age of 10. We should be able to know what the process is, for if we do not, we are likely to misunderstand the symbol — i.e., the character of the progressions, the field of experience to which they should be referred — and to use it wrongly or apply it to the wrong level of existence. We may believe, for instance, that the symbolical techniques which we call "progressions" refer to actual physical-plane events, while actually it may have meaning in terms of some psychological factor behind the events, a factor which may or may not exteriorize itself as events. What then is happening within the total psychosomatic organism of the baby during the days following birth? Can we know? I believe that we can get an idea of the deeper process going on after birth if we think of the relation between conception and birth, also between the prenatal and the postnatal forms of existence, which I will discuss next. It has been shown that in the earliest stages of development from the fecundated ovum, the human embryo repeats very briefly the successive stages of the evolution of life on earth. The very narrow band of space on either side of the planet's surface has been called the "biosphere." It is the realm of life on earth; it includes the seas and the surface of continents and the atmosphere up to a very few miles up. It is the planetary womb within which all earthly life is given form and substance and finds itself dominated by the power of gravitation. When the embryo reaches a certain stage of development, it becomes entirely "human"; and sexual differentiation begins to take place. Then it begins to move and kick; finally, it is "delivered" into the realm of air. It gasps for air; and in that act, the pattern of blood circulation is changed, dividing itself into its arterial and venous circuits; the breathing rhythm is established. It would seem also that thereafter another kind of rhythm is built up which refers to the cerebrospinal nervous system and pulsations in the cerebrospinal fluid in which that system is bathed; unfortunately, modern biology does not seem to be as yet very aware of what takes place in this nervous system of the baby or has not yet interpreted what it knows within an overall concept of a well-defined process. There are nine months of prenatal life. But the cycle of the year encompasses twelve months; and our zodiac — which is a symbolical expression of this yearly cycle and of the earth's orbit — has twelve signs. If we really understand what a cycle means, we should ask ourselves the obvious question (but obvious questions are very often not asked): What happens during the three months after birth? This is the key. Something happens during these 90 to 92 days which is so basic that it affects the entire life of the person — a life which may well last some 90 years. It is something as basic as the change which took place in the embryo during the three months before birth. We can well say that after six months of growth, the embryo is sufficiently humanized to be born as a viable organism in the world of humanity. Before that, the embryo was not yet quite human; it belonged to the earth's biosphere together with all other living things. But at or near the beginning of the seventh month, it enters the magnetic field of the human kingdom; it belongs definitely to a certain race and ancestral lineage as an actual and viable organism; and it develops its human-ancestral potential during three months more in a particular mother's womb — or, in cases of premature birth, in an incubator and in a hospital which are the products of human civilization throughout the ages. Then, normally, the baby is born. His tiny body will grow more or less rapidly, still so closely bound to his mother that he seems hardly separated from her. But he breathes; gradually, his eyes open, his senses become alert. A prodigious process is at work correlating and adjusting to the myriad of impacts upon the brain. It will take three more months for the Sun to return to the position it occupied at the moment of impregnation of the mother's ovum. What happens during these ninety days within the baby? Simply this: on the basis of his first act of independent existence (the first breath), the child is building the foundations for the gradual actualization of the essential characteristics of his human status — i.e., individual selfhood — through the development of individualized potentialities of intelligence. What do I mean by this word "intelligence"? Perhaps I can express this meaning quite clearly by using the Christian symbol of the Trinity and saying that God, the Father, refers to the basic genetic structure of the human organism; the Son, to the potentiality of individual selfhood represented by the birth-chart — i.e., to the fact that this particular human organism came out of the mother potentially able to fulfill his destiny as an individual person. The Holy Spirit represents that power which will enable this person actually to become an active, essentially free and responsible "individual" — and this power is what I mean by intelligence. The birth-chart, as I see it, constitutes the formula of our true individual selfhood. It presents us with the picture of that particular being which the universe, or God, is creating at that particular time and place which sees the start of our independent existence. As we undergo birth, we have a past — which is our prenatal condition as an embryo, end of a long series of ancestors, human and pre-human. We are now our birth-chart, our "signature of destiny," our essential individuality as a potential individual; but let us not fail to see that the birth-chart, at birth, is only the pattern of the possibility of becoming in actual fact an integrated and fulfilled person from whom the principle of divine Sonship (the Christ within) would radiate forth in love and creativity. Why is that possibility not always realized? It is fundamentally because we have to actualize this possibility in the collective environment of a family, a culture, a society, a race, a planet — all of which exert upon the growing child and adolescent constant and powerful pressures, many of which tend to obscure, stifle, or distort and adulterate this individual birth potential (i.e., what Zen calls our "fundamental nature"). Every birth-chart could lead to the manifestation of "divine Sonship" in one form or another; but this process of actualization of our potential of individual selfhood (i.e., of the God within) requires the development of the conscious mind through a multitude of impacts and relationships, for it must be a conscious process. Our family, our religion and culture, our society and all interpersonal relationships derived from its patterns of behavior provide us with raw materials for the growth of our conscious mind and the necessary development of an ego. But this very process produces all sorts of tensions, fears, withdrawals, unnatural desires, ambitions, etc., which nearly always tend to make us what we are not essentially — i.e., what our birth-chart should reveal we are, potentially. It is to all these impacts, pressures, and influences of the environment (psychic and mental as well as geographical, cultural, and social) that the transits refer in astrology. These transits constantly exert a pressure upon our permanent and essential identity, symbolized by our birth-chart. The pressures may cause pleasure, happiness, exaltation — or pain, misery, and depression. Some may strengthen basic factors in our nature; others may tend to disintegrate our personality. But, generally speaking, they are that which every day and year after year challenges us. What is it in us which will accept these challenges and make of them opportunities for becoming more and more that which we potentially are? This is our "intelligence." The power of intelligence is, I repeat, the Holy Spirit within us. It alone can transmute all that we find in our outer and inner (i.e., psychic-mental) environment into food for our growth as an individual person conscious of being that which it was originally as a particular birth potential. The birth potential remains what it is; this the permanent factor in us, the seed form, the "fundamental tone" of our individual being and destiny; but nearly everything that surrounds us will tend to change its vibration, even with the very best intention, even through parental love and all kinds of love. Thus, astrological transits forever tend to change the form of our essential birth potential; and it is in the progressions that we can witness the Holy Spirit — the power of intelligence — at work within us. It is during the days and weeks after birth that this power of intelligence primarily develops, for it is then that, confronted with the family environment — and with all that is back of its ways of life, its biases, and its beliefs — the Holy Spirit continues the process of formation of the necessary means and capacities by using which the human being can handle intelligently the everyday challenges of the rest of his life and thereby follow the path of personality integration. From conception to about the end of the sixth month of embryonic existence, earth materials are being structured by the planet's life to become organized into a human being. For three months afterward, this human being is developing the specific capacities that belong to his family, his race, his society so that he may be able to emerge out of the mother as a potential individual person. Three months remain in the year's Jupiter or Saturn and other planets. The Sun progresses only some 90 degrees; but its passage from one sign to the next usually marks a very noticeable modification in a person's basic responses to life. As Mercury and Venus remain always fairly close to the Sun, they cannot move by progression in a lifetime around the whole zodiac. Only the Moon can do so; and the progressed Moon returns to the Moon's natal place every 27 to 28 years, thus making usually at least two complete circuits around the birth-chart and, in the process, passing over all natal planets and house cusps. As in astrology nothing is totally and individually significant which does not make a complete cycle of motion around the zodiac, the most significant factor in the progression technique is the Moon. More significant still, however, is the cyclic change in the soli-lunar relationship — that is, the lunation cycle of some 30 days. In terms of progressions, this means a 30-year cycle, the "progressed lunation cycle." From the way I see and analyze it, this progressed lunation cycle (from one progressed New Moon to the next) provides us with an over-all moving picture within which all other progressions find their place and acquire a broader meaning in terms of the total development of the personality. Essentially, it is the progressed Sun which marks the successive steps in the actualization of this Spirit-imparted intelligence which enables a human being to become fulfilled as a conscious and creative individual person. Progressions depend primarily upon a solar cycle; it is the 12-month solar cycle of the year which controls the 9-month gestation period and the three-month postnatal process of building in the patterns of intelligent and effectual responses to life in the cerebrospinal nervous system — thus, the formation of a potentially complete human person. For this reason, the progressed Sun's motion year after year is the basic factor; and the symbol of the degree on which the progressed Sun is located during each 12-month period is often quite revealing. (I use the Sabian Symbols which can be found in Marc Jones' book and in my "Astrology of Personality," now once more available, [and, later An Astrological Mandala.]) For instance, at the time of a highly Uranian progressed Full Moon in my life, the progressed Sun was on a degree symbolized by "a new continent rising out of the ocean." Something had to emerge within me — a new approach, a new mode of intelligence. Yet there can be emergence, in such a case, at two or three levels — and it is the level which conditions the actual events, not vice versa. If the progressed Sun symbolizes intelligence in action, the progressed Moon represents the energy being distributed to sustain the application of this intelligent power of integration — thus, also the focus of the individual person's attention upon one field of experience or another. The natal house through which the progressed Moon is passing at any time indicates what this field of experience is, and the passage of the progressed Moon over the four angles of the natal chart is particularly significant. The progressed Mercury has much to do with the character and effectiveness of the mental apparatus through which the person's attention is being focused; and the years of life which correspond to a change in the direction of Mercury's motion (from direct to retrograde, or vice versa) are seen to be in most cases periods of change in relation to the environment or to the collective mentality of one's community. The progressed Venus should give indications concerning the sense of value and the feeling responses of the individual, as these are being modified by experience and age. The progressed Mars may move far enough from Mars' natal position to indicate changes in the relationship between the desires and the life ambition of a person and the external objects which draw him out and help him to mobilize his energies. In any case, it is the angular relationship (aspects) of the progressed planets to the Sun and the Moon (natal and progressed) which is the most basic factor in progressions, plus the entrance of these planets into new signs and houses. Copyright © 1965 by Dane Rudhyar.